Animal Wildlife | Mule | A mule is the result of the mating of a male donkey (jack) and a female horse (mare) to produce a hybrid. The much rarer hinny is the result of mating a female donkey (jennet) with a male horse (stallion) although the hinny is much harder to produce than the mule. The jennet's reproductive system is more efficient at detecting and eliminating foreign DNA than the mare's is. The hinny conception rate is lower and the miscarriage rate is higher. 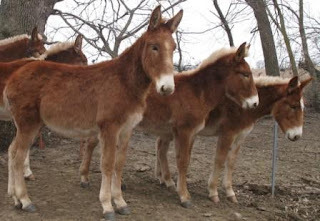 It really isn't possible to distinguish a mule from a hinny by appearance. 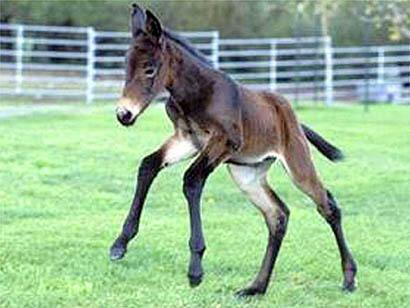 Mules are anatomically normal and show normal breeding behavior unless gelded (castrated) early in life. Mules are sterile due to an uneven chromosome count. 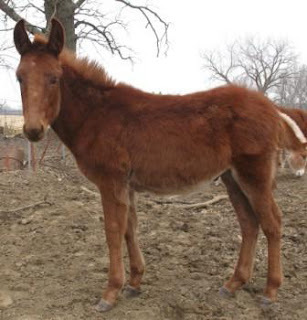 There are have been a very few rare cases since the 1500s where female mules have been known to produce a foal when mated to a stallion or jack. Males are completely sterile, and as an old muleman said,"Ain't nothing meaner than a stud mule!" Mules are commonly found around the world in any area where there are donkeys and horses inhabiting the same environment. Mules have been bred by humans for use as riding and pack animals, and for ploughing or any work one does with horses. 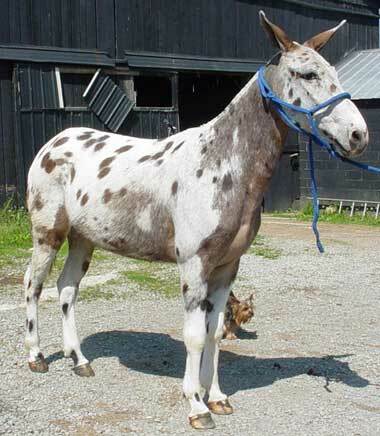 The mule's body type and temperament depend on the breed of mare and jack used. Huge draft mules are created by breeding draft horses such as Belgians to Mammoth jacks. They have the size and power of the draft horse with the mule's ability to tolerate heat and less feed. Racing mules are produced using Throughbred mares, and trail mules are often produced from Quarter horses, Paint horses, and Appaloosas. 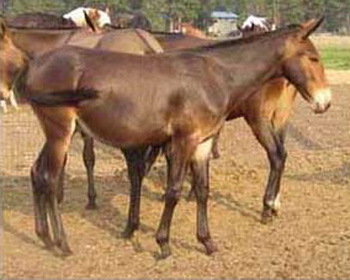 Mules come in any horse or donkey color or combination of both. A mule is easily distinguished from a donkey by looking at the tail. A mule's tail is haired all the way to the top like a horse's tail; a donkey's tail has a tuft on the end like a cow. They compete successfully with horses in all venues including dressage.